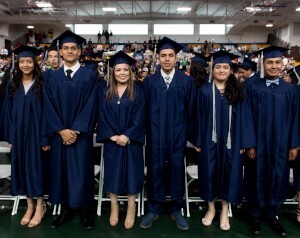 Arrupe Jesuit makes a college preparatory education an attainable goal for families, who due to financial need, do not have the opportunity to receive a private, Catholic school education. Arrupe Jesuit serves 430 students (93% of our student body is Hispanic, 2% African-American, 1% Asian, 3% Caucasian, and 1% other). 78% of Arrupe students qualify for federal free and reduced lunch for the 2018-2019 school year. 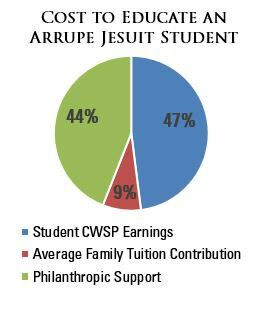 As education costs continue to increase, Arrupe Jesuit maintains an affordable tuition and is the only school able to fund 100% of families’ assessed financial need. 93% of Arrupe Jesuit families receive financial aid to offset tuition. The average income for a family of four is $39,815. 94% of the Class of 2018 are the first in their family to attend college and 55% were the first to graduate high school. 100% of Arrupe Jesuit’s twelve graduating classes were accepted into at least one college or university of their choice. Members of the Class of 2018 are attending 21 different colleges and universities. Our 783 alumni have earned over $57 million in scholarship dollars to date. Our alumni maintain a 70% college persistence rate as of December 2016 (defined as either currently enrolled in college courses or have earned degree or certificate). Only 1 in 3 students who start Denver Public Schools in 9th grade will graduate on time and go on to enroll in college. 64% of African American and Latino students graduated from high school compared to 78% of Caucasian students. 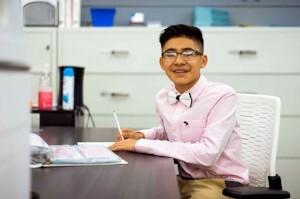 Arrupe Jesuit helps to reverse these patterns by providing an affordable college preparatory education to hundreds of students who would not have this opportunity otherwise. Students work one day per week at over 130 area businesses, including law firms, health centers, banks, government offices, and nonprofits. Students earn approximately 50% of the cost of their education through the CWSP. Students gain valuable work experience and are able to contribute to the cost of their education. 96% of students received a rating of good, very good or outstanding by their CWSP supervisors in the 2017-2018 school year. Average daily CWSP work attendance is 98% (100% with make-ups).